Does your partner or ex-partner do things that make you feel scared or unsafe? Or do you have a friend whose partner or ex-partner worries you? It can be hard to know if you are experiencing the typical “ups and downs” of a relationship, or if it’s something more serious— maybe even unsafe. 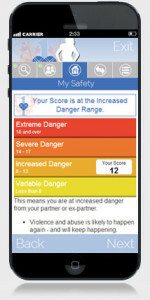 The One Love My Plan App includes the research-based Danger Assessment that enables a user to answer a series of questions to determine if a relationship is unsafe. After answering the questions, the app provides the user with a score on a scale of 0 to 20. The danger scale ranges from variable danger to extreme danger. While violence of any magnitude is unacceptable, seeing a high score on the scale can be a wake-up call for many facing a dangerous situation. After assessing the danger level, My Plan helps create an action plan by assessing and weighing the user’s unique characteristics and situation so they can decide on an action plan from the suggested strategies. To learn more about One Love Foundation visit joinonelove.org.